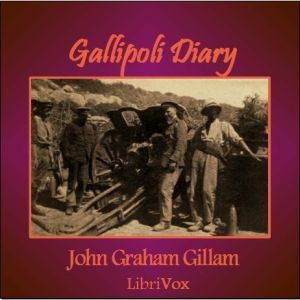 Major John Graham Gillam, British Supply Officer, wrote in his World War I Gallipoli Diary that when he sailed from England for the Dardanelles in March, 1915, he had visions of "trekking up the Gallipoli Peninsula with the Navy bombarding a way for us up the Straits and along the coast-line of the Sea of Marmora, until after a brief campaign we entered triumphantly Constantinople, there to meet the Russian Army, which would link up with ourselves to form part of a great chain encircling and throttling the Central Empires. . . We little appreciated the difficulties of the task," he continues, in potent understatement. Gillam's charge was shepherding supplies--food and munitions--from beach depots to the trenches for a brigade of 4000 men. Since it was his first experience with "real war," he decided to keep a diary, which he did from the day he landed at Gallipoli (April 25, 1915) until he was evacuated at the end of the campaign in January 1916. He aptly states in the preface to the published Version of his diary: "those who desire to survey the whole amazing Gallipoli campaign in perspective must look elsewhere than in these pages. Their sole object was to record the personal impressions, feeling, and doings from day to day of one supply officer to a Division whose gallantry in that campaign well earned for it the epithet "Immortal." As the campaign intensifies, Gillam's entries mature. Early on (May 30), a sample entry: "This afternoon I ride . . . to Morto Bay, and on the way have a delightful cross-country canter. I have difficulty, though, in making my mare jump trenches. She jumped hurdles at Warwick race-course like a bird." A month later, on June 30, "The smell of dead bodies is at times almost unbearable in the trenches, and chloride of lime is thrown over them. I know of no more sickly smell than chloride of lime with the smell of a dead body blended in." Another month, and respect for the Turks, and also for the rugged terrain of the peninsula is evident (August 29): "Behind me, purple Turkish hills, every point of which is held by the enemy. Then in between our line and the hills the scrubby low-lying country. . . I look at it hopelessly--for I know now, as we all do, that the conquest of the Peninsula is more than we can hope for. All that is left to us is to hang on day by day. . . Death in various forms walks with us always . . ."
Today, the Turkish Government maintains a war memorial and cemeteries at the Gallipoli Peninsula Historical National Park. Memories are very much alive there. Preserved trenches and the sad graves of many, many soldiers from both sides of the conflict are made especially poignant by the beauty of the setting-- the sea and high hills beyond.